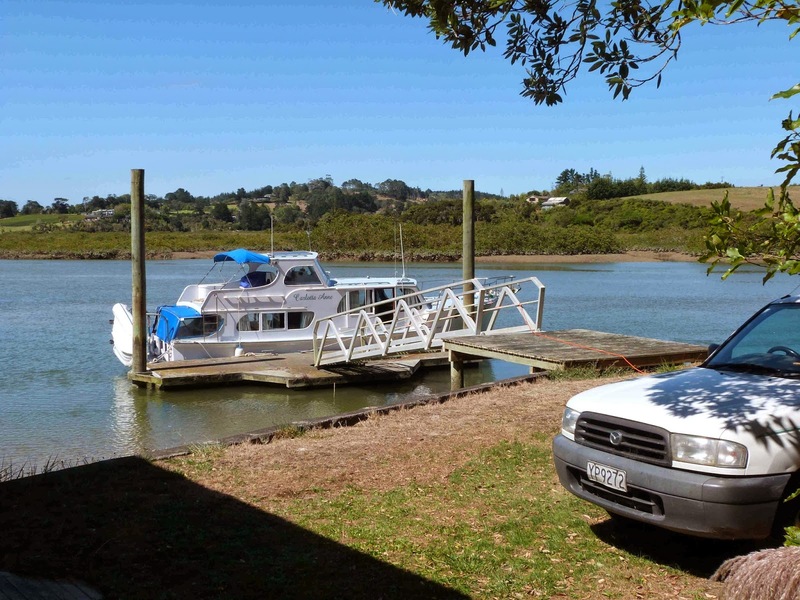 I was going to unhook the dock lines and head for Waiheke on this afternoons tide. The morning started well, and I drove over to Silverdale to see what the “Wade River Festival” was all about. While the people were all enthusiastic and the music that the two folk musicians were pumping out was nice, four tents and a half hour of haranguing by a group of maori who where supposedly giving a welcome speech was not going to hold me for long. I did though sign up as a potential volunteer worker for a walkway that is being built from Silverdale down about a kilometre along the northern river bank . The "Wade" river is the river on which I am moored, and Silverdale is the town at the navigable limit of the river, it was a nice place until suburbia caught up with it, a huge, sterile town center was built and the industrial area expanded. There are patches of publicly owned land here and there, and the walkway project is one of several attempts to preserve that public land in a form that is attractive to use. I got back to find that the forecast SouWesterly change had arrived, the ship surging around on her lines and the estuary white and streaky with what must have been close to 40 knots of wind ( The marine nowcast said Tiri channel weather bouy not far from the rivermouth was peaking at 38 knots) and I decided that I would be more comfortable here than out in the middle. 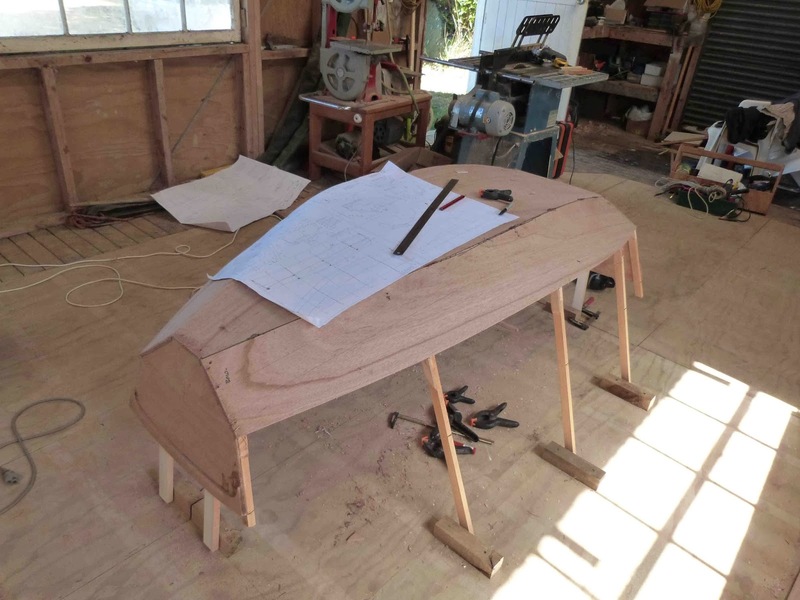 Consequently I am fitting the garboard planks to the little dinghy, will scribe and fit the topside planks this afternoon and expect to have the thing close to done by the end of the week. When that’s done I’ll start on SEI (named after the small Whale species) as its both capable of voyaging around the gulf and rowing quite long distances so will suit the estuary. I've had several enquiries about this little boat, all going well plans will be ready soon. I'll be putting the topsides planks on this afternoon and then it can be taped up. I’ve painted up Dennys old plywood kayak, one that I built with her help more than 20 years back, and have twice now scrambled out of bed just before dawn on the right tide and headed up the river to watch the sun come up. I managed to get my hands on a piece of carbon fibre tube the right length and diameter so have built a nice light paddle, makes things so much easier. Dawn when afloat so close to the water and sitting in a patch of native bush with the birds waking up is a very nice way to start the day. The other job happening today is to scrape out and re putty a couple of the ships windows, they are most of them needing attention so with the warm wind to dry things out I’m doing a bit of prep work and will paint them soon. While setting up the boatshed as a workshop I took advantage of a sale deal at Bunnings hardware, they have a cheapo power tool house brand called “Ozito” and I’ve bought a cordless drill, a thickness planer, a power screwdriver, an angle grinder with sanding pad and a cordless multitool. That’s a little thing with a vibrating head that can take various blades or sanding heads, and I’m finding that the sander configuration is excellent for the small work inside the ship, so am just starting to get ready for a new coat of varnish in some of the sun struck areas inside. Those amazingly cheap tools are some of them good, one or two very good and one or two terrible. Dont buy the cordless screwdriver, its a waste of time and the 14.4 volt cordless drill is not brilliant, but the multitool is great and the other items work fine. 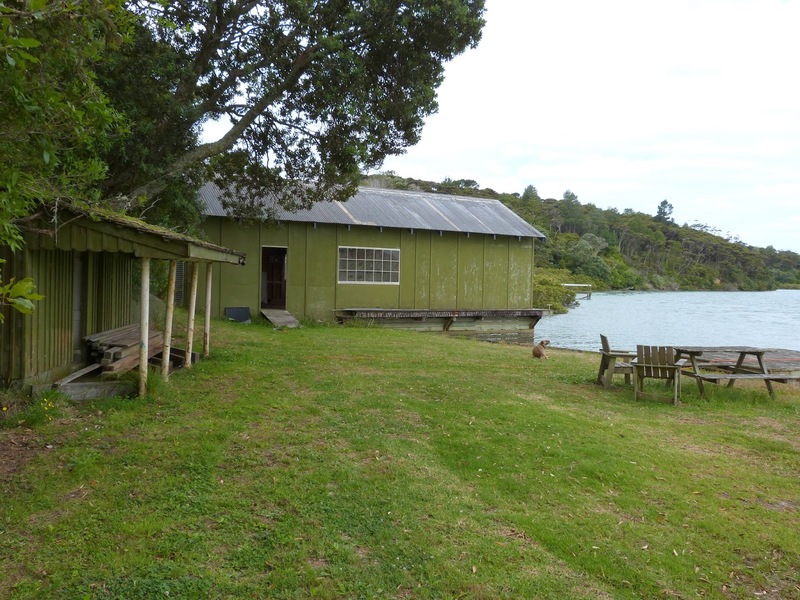 The current plan here, apart from all the other plans, is to make a grid alongside the boatshed. I figure that if I put a ladder down from the walkway along the side, I can get down there and excavate a patch down to something firm enough to stand on. I’d need to take the fill away, so its going to be a couple of buckets full at a time into the wheelbarrow at the top of the ladder and wheel it along to the end of the seawall to dump. It will be out of sight there so I wont get a well meaning greenie asking if I have resource consent. I don’t think that I’d need to go to the gym for a while, but it will give me a nice secure space for “May” where she can sit between tides. I didn’t get this sent yesterday, got all involved with the little dinghy and then found that it was suddenly time to meet someone. So, back again. It’s a near perfect day here on the river, 82 deg, gentle breeze, so for those of you who are stuck in the northern hemisphere winter here is a preview of your summer to come. In the meantime I"m off out in the kayak. The view downstream from the boatshed. Its about 4 miles down to the rivermouth, while the channels are narrow at low tide I'm ok above half tide. The view from the upstream side of the boatshed across the river. If you’ve read the previous post that I put up a couple of hours ago you'll know I was complaining about the weather. Its just stopped raining so I went and pulled the card from the camera and here is the next post , with pics. Two in one day, wonders will never cease! Thats the shed from outside, about 40 ft x 14, thats 12m x 4m, about. 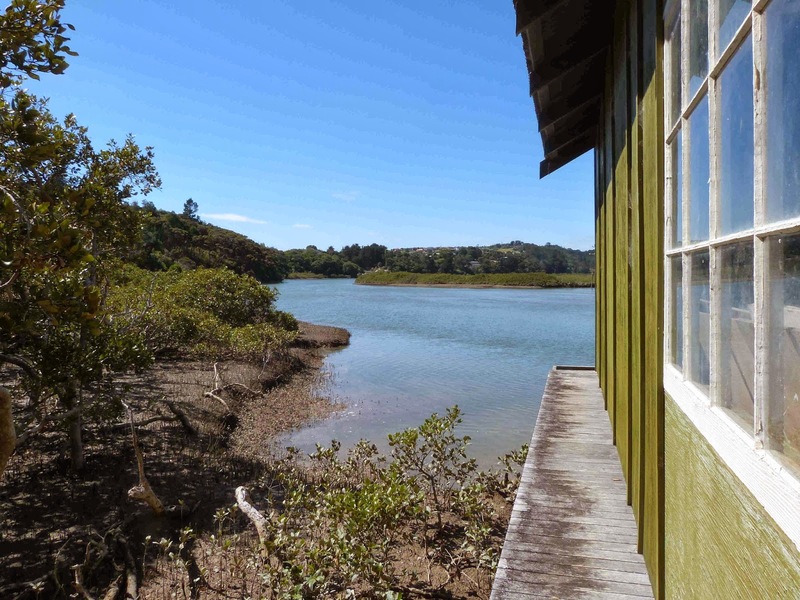 Nearest is what used to be shower and changing sheds for those swimming in the estuary, the family who built all this were serious about their recreation. 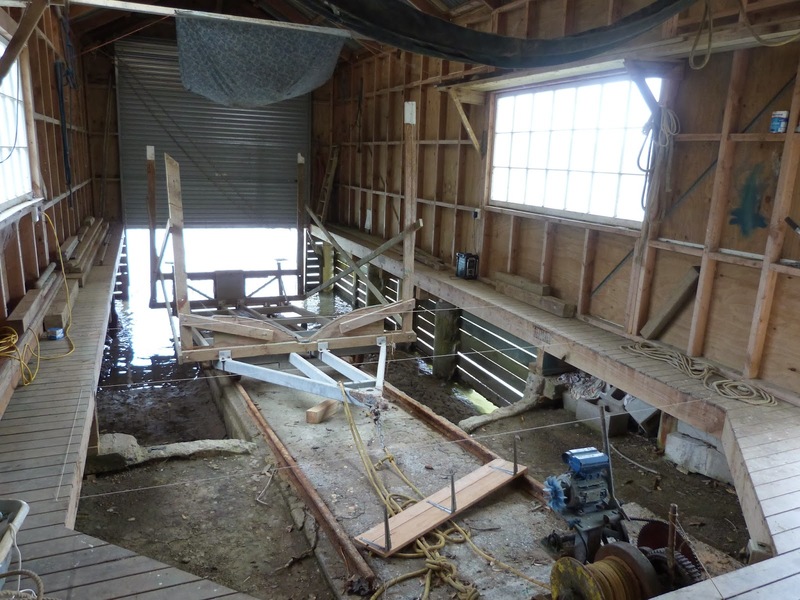 The boatshed is a slipway boatshed, designed to have a trolley on rails and a winch to haul a boat inside for maintenance or safekeeping. But its been disused for quite a while, and while the building is ok the slipway rails are not, the trolley is not in the best of shape and the slipway winch needs a lot of work too. I don’t need the slipway, my ship wont fit in there so I’d asked the landlord who kindly said yes when I proposed putting a floor in over the gap so I’d have a shop to work in. The shed splipway area looking out toward the water end, there is about a plywood sheet length from this end of the opening to the land end of the building. I've just fought the reluctant trolley down the ways a bit to make some space, its an old road trailer with railway wheels bolted thereon. The wheels being rusted solid makes it hard to move. I hate to think what it weights. Someone said "Give me a long enough lever, and a fulcrum and I'll move the world!" Yeah, right! So, bearing in mind that this floor has to be both removeable and very strong, I went hunting for bargains. 18mm CCA treated construction plywood came from 3 Brothers Hamilton, its downgrade. A lot of it is forklift damage or dinged corners but as a regular there owner Trent did not mind me sorting through to get sheets where the damage was such that the sheets still suited my purpose. Placemakers builders yard had 100x50 (four by two ) CCA ( exterior grade preservative) “fence rails” on special, so I sorted through those to get the clear lengths that I wanted, bought some hot galvanised flooring screws, joist hangers and such from the same place at trade rate ( thanks guys) and got started. I borrowed a big wheeled automotive trolley jack (one with wheels on) and heaved the trolley up onto the rails then used a block and tackle (the wheels are rusted solid) to slide it back to the door leaving me a clear space 14 ft wide and 28 ft long. Yes thats water, at high tide springs the floor is about 750mm (2 ft 6in) above the water. The new part of the floor is two and a half sheets long, thats eight and a half sheets of 18mm plywood, 14 lengths 5.2m ( about 16 ft) of lumber under it, plus 14 jackstuds down to the concrete underneath the rails. All screwed together ( about 300 x 50mm cs screws) so in 5 years I can pull it all out when I move again. I can tell you that this caused some serious sweat, I'm not quite right yet so had to do this in achievable bites. But its done! The floor structure is supported by 100x100 posts, and a grid of joists and spans at close intervals across and along. The plywood is well screwed down, does not flex noticeably under load and the place feels very nice to work in. I’ve built some shelves, one big cupboard with another to come, and brought in the machinery. My elderly uncle was a joiner by occupation, and his home workshop included a bandsaw, little jointer, and a table saw. He’s 83 and not very interested in using them now, so I exchanged a few bucks for same and now have those set up and running. Bunnings hardware had an “Ozito” brand (its their cheapo house brand, more on this later) thickness planer there for $600, but the one on display was missing its box, manual, setting gauges, adjustment handle and cord. It was the last one in stock so after some bargaining I left with it for $475. Brand new, never been used. I have the cord sorted, already had a set of setting gauges, and the $26 replacement winder handle will be here in a day or two . I got several other Ozito tools, but like I said, more on those later. Next trip into the same place, sale price again I bought a Ryobi bench grinder with a linisher (sanding belt for metal but it handles wood just fine) on the end opposite the grinding wheel. I need that for tool sharpening but the linisher is a wonderful addition to the shop capabilities. I’ve still got a workshop in Hamilton, it has all this stuff, but if I have it at one end of my life, it wont be at the other end when I want to use it there so I’m setting up with cheap product here at the boatshed, and will do the heavy stuff at the other shop. Just as well I drive a pickup. I’ve begun building, as mentioned in the previous post, have the frames all stood up, transoms on and the bottom panel has just been slathered with glue and screwed into place. As this is to be “a plan” (available in a couple of weeks) I am doing a trial build to get the corrected offsets for the panels, found a couple of errors so far but expect more as the panel offsets came from a 1/5 scale model and I don’t think that they are as good as my customers deserve. Looking back from the water end into the shop. 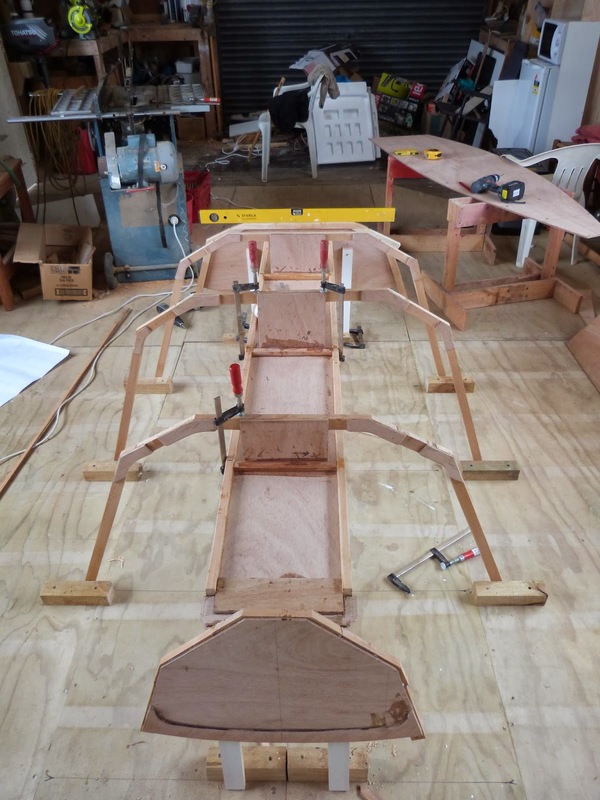 SCRAPS is taking shape, all frames and the transoms up, the seat forms the brace that holds it all together until the planking is on, and you can see some of the machinery and the workbench with vice at the back. Its a nice feeling space, fairly good light apart from over the bench at the back. I will be hanging an industrial flouro twin tube light over there and that should about do it. Oh yes, there is, if you look hard you can see it, a rollup door in the land end of the shed, so even if I cant get a boat out the little side door, and dont want to fuss with opening the locked doors at the water end I can still get a boat out. As a by the way, I’m expecting this little boat to come in at about 60 lbs. PS, I ran a hose down through the bush yesterday. I had 90 metres of it and was about 2m short, but got more today and now have potable water at the boatshed and across to the ship so I don’t need to motor for an hour each way to fill the tanks. Real progress, with that done showers can be as long and as luxurious as I want. I’m filling the 800 litre tankage up as I write. Hear that gurgling? It’s the sound of progress. Just a quick post today, no pics as its raining and my camera is up in the boatshed. 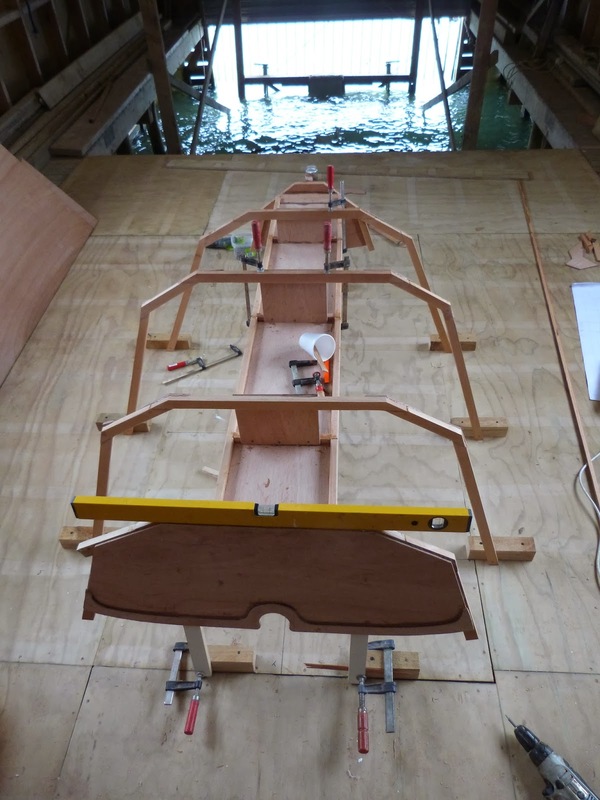 I have almost completed setting up the boatshed as a workshop, have a temporary plywood floor built over the slipway ( which is too small for my ship so I cant use it anyway) and am busy building the prototype of a little dinghy for the sloop. The last one worked, but the constraints of fitting it into the cockpit of the sloop meant that it was just a little too small, 5ft 6in is a very small dinghy and I'd been having issues with low blood pressure causing poor balance so needed a little more stability. Annie Hill ( the "Voyaging on a Small Income" book lady) bought it, and she's petite to be polite, fits the little boat perfectly and can lift it up on the deck of her liveaboard junk rigged 26 footer without any trouble. The shape worked well, and in fact in spite of its tiny size the wee thing was better than you'd expect but now I drive a pickup truck I can carry a bigger dink in the tray on the back while towing the sloop on its trailer, so the new one will be a little longer and a little wider.